Coast, photo by Harold Davis. View this image larger. 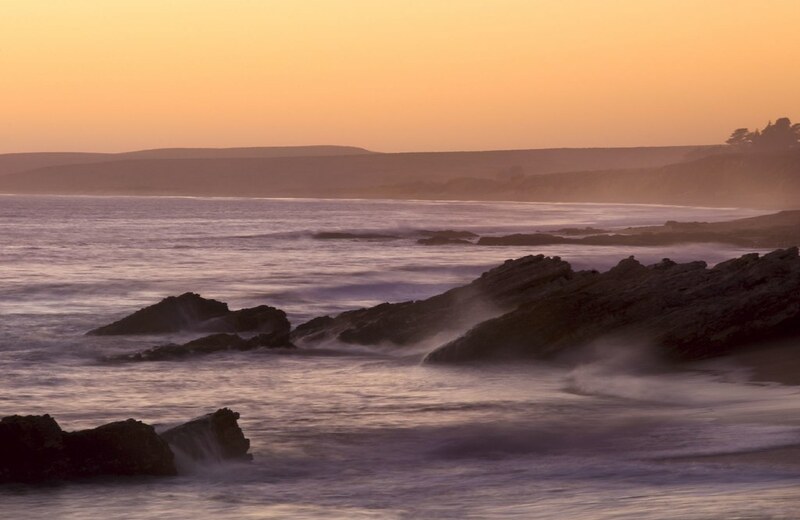 This photo looks north from Sculptured Beach, looking towards Limantour. 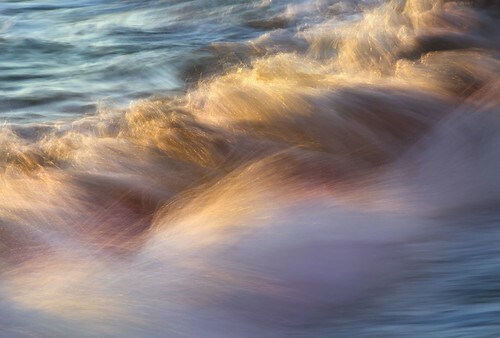 The one second exposure creates a calm effect, taking the edge off the rather violent wave action, while still showing the waves in a recognizable fashion. Sausalito & Belvedere, photo by Harold Davis. View this image larger. 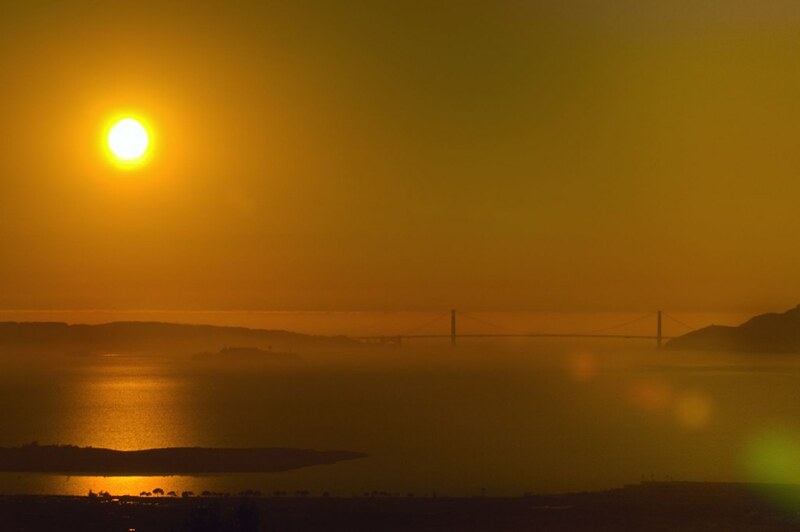 From the cliffs above Sausalito, in one direction the Golden Gate Bridge in alignment, and across the bay, San Francisco. 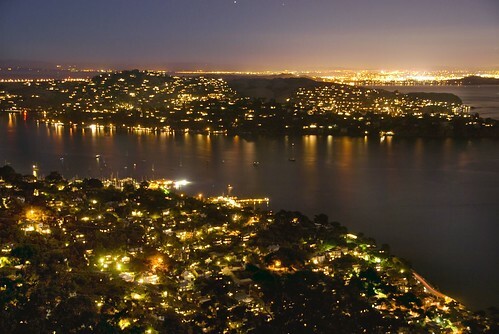 In the other direction, Sausalito & Belvedere Island with lights, terraces, and pleasure craft. This is a night scene in the city, but looked at abstractly it could be something like a blow-up of an amoeba, or? 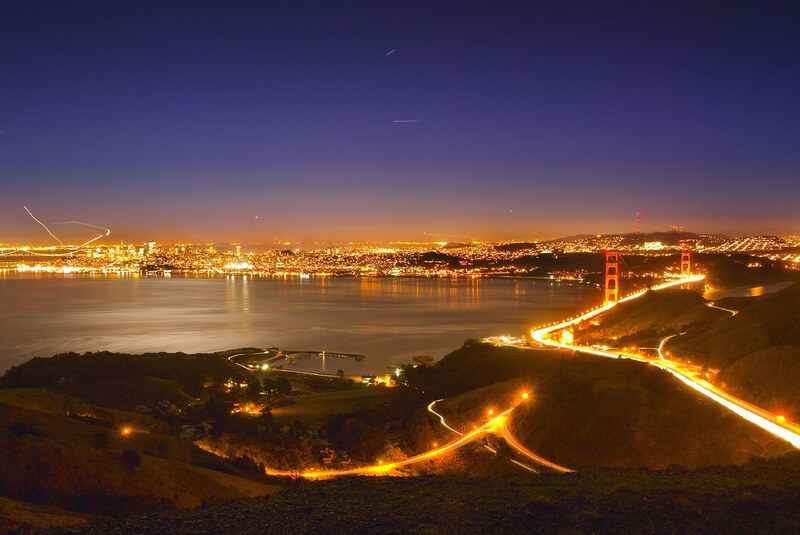 Related image: Sausalito at Twilight. Boy in a Box, photo by Harold Davis. How time flies! Lo and behold, the babe in a basket has transmogrified into a boy in a box! I photographed our Mathew Gabriel in the box at ISO 800 using my Canon G9, and then post-processed for noise reduction. Glorious Gate, photo by Harold Davis. View this image larger. 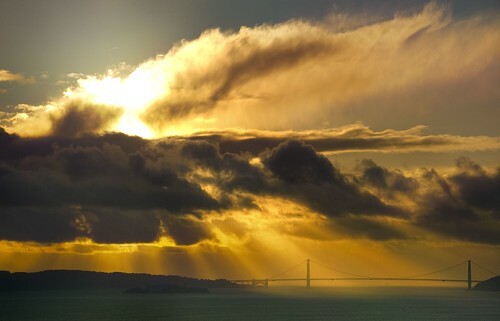 Sometimes things come together and the view out the Golden Gate is glorious. 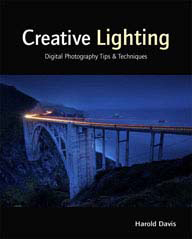 All you have to do is stand there and press the shutter release. Moon Roll, photo by Harold Davis. View this image larger. On a full moon night, I photographed from Kirby Cove. 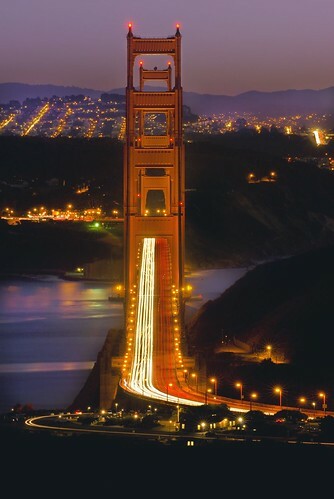 The moon was rising from behind and below the Golden Gate Bridge. As the moon rose, it seemed to	be in position to “roll” along the suspension lines. I exposed so that some of the background would be apparent, causing the moon itself to blow out with overexposure (this is seen more often with the sun than the moon). When I post-processed, I decided to leave the high contrast effect intact. Golden Gate Adventure, photo by Harold Davis. View this image larger. The Adventure Cat is a catamaran used for sail-powered tours of San Francisco Bay, and around the Golden Gate Bridge. 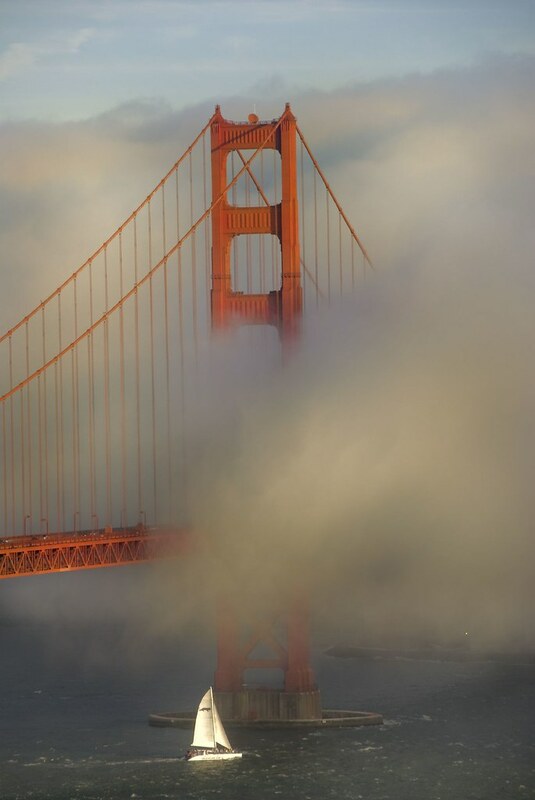 Somehow, the Adventure Cat seems to turn up in many of my photos of the Golden Gate. I guess she’s there just about at sunset, and so am I. By the way (and there’s absolutely no inducement for me to say this), sailing with the Adventure Cat is great fun. I do recommend it. Into the Sunset, photo by Harold Davis. View this image larger. These four photos are from my 2005 archives. 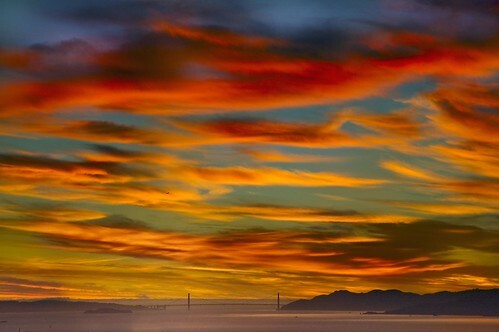 It turns out the winter of 2005 was specially good for sunsets in the San Francisco Bay area. 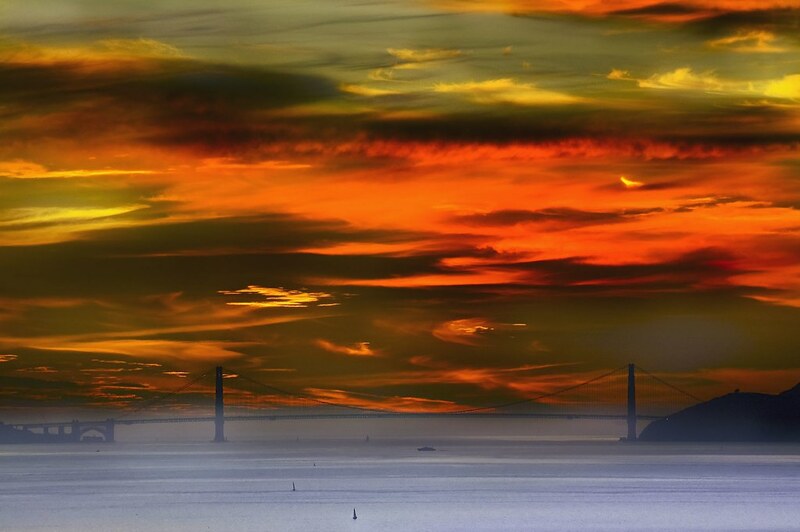 Each photo is a sunset view of the Golden Gate from across the San Francisco Bay. They’re all arguments for carefully archiving all of one’s photos, even if the photo isn’t processed right away. 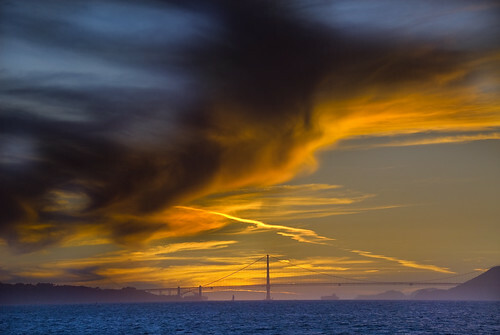 Each of these images is a candidate for inclusion in my Golden Gate book. Let me know which one you like (or if you like more than one). Night Beach, photo by Harold Davis. View this image larger. 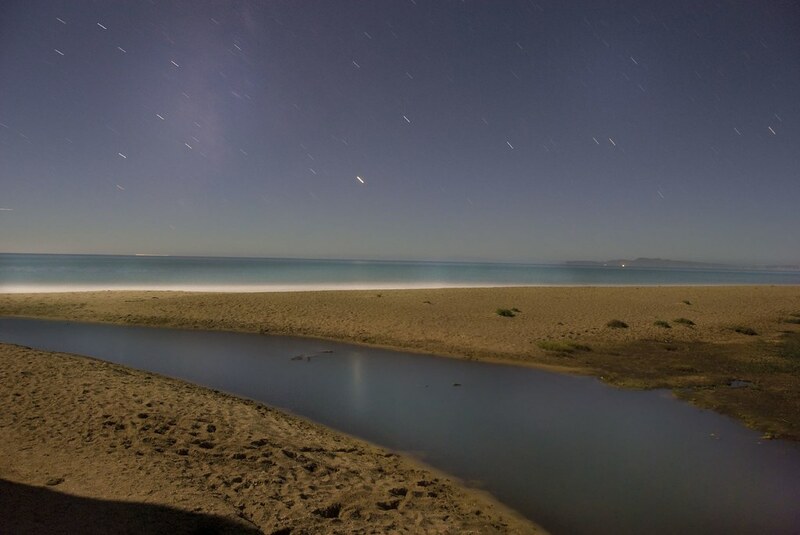 Heading home along the night trail, I stopped to take this photo of a night beach on Point Reyes. I like the way this three second time exposure makes the car lights look abstracted but still recognizable. 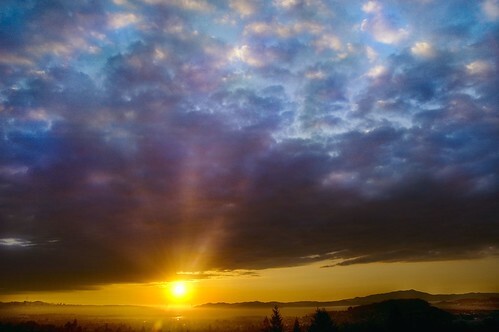 I took this photo early in the evening from the location across the mouth of the Waldo Tunnel described in Alignment. I used a long lens, my 70-200 VR zoom combined with a 2X telextender at the maximum focal length. The 400mm effective focal length translates to 600mm in 35mm terms, considering the Nikon 1.5:1 sensor equivalence. In Photoshop, I cropped further in on the portion of the photo that interested me, namely the bridge roadway, walkways, and car lights. 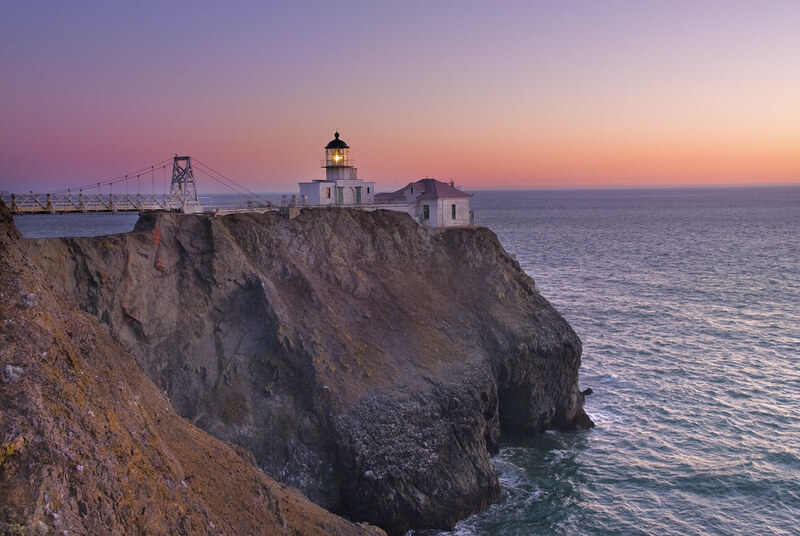 It probably goes without saying, but let me say it: cropping in on an image in post-processing is the logical equivalent of using a so-called “digital” zoom in-camera. Night Trail, photo by Harold Davis. View this image larger. On the night trail home from Sculptured Beach, I stopped to take a photo near where the Coastal Trail meets the Woodward Valley Trail. 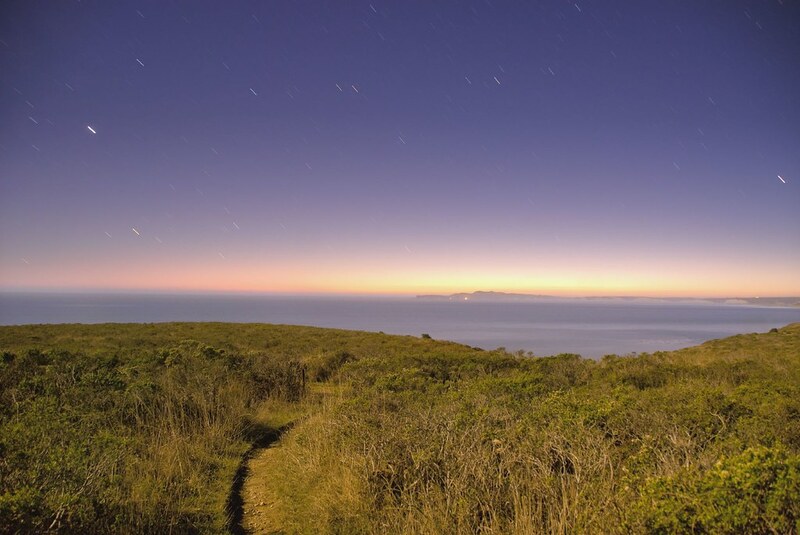 You can see the broad sweep of Drakes Bay and the outer Point Reyes peninsula in the background, also star trails and the lighthouse in the distance. With a three minute exposure at f/3.5 and ISO 400, this night scene appears as bright as day. Beauty and the Bay, photo by Harold Davis. View this image larger. Treasure Island juts out into San Francisco Bay. Often windy, this forlorn ex-military base has now been partially converted to housing projects. The housing stock is seedy and decaying. The shoreline of Treasure Island, where I took these photos, is one of the easiest straight shots of the Golden Gate. The only hazard or danger is the merge back onto the Bay Bridge at Yerba Buena Island when you head home. Particularly in the Oakland direction, the merge is a true adrenaline rush. Point Bonita Lighthouse, photo by Harold Davis. View this image larger. I’ve been photographing the Golden Gate for years now (quite literally) for a book project at all seasons, in different weather, and from as many good locations as I can find. I can’t believe it, the project is coming to an end. The book is at the point of design, and I have a pool of more photos (shown here as a Flickr set) than I can possibly use. Still, this is the use it or lose it moment. So I’ve been going back through my archives, and post-processing worthy photo candidates. 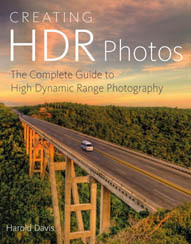 Help me decide which photos to include in my book! If you have any favorites from my collection of Golden Gate photos that should definitely be in my book, or if you particularly despise one of my Golden Gate photos, please drop me a line and tell me. San Francisco from above the Waldo Tunnel, photo by Harold Davis. View this image larger. The Waldo Tunnel guards the northern approach to the Golden Gate Bridge. From the mound hundreds of feet above the tunnel roof, lights of San Francisco spread out before me. It was not quite a digital night situation because of the strong ambient light from the city. The lighting on the roadways approaching the bridge cast a fiery glow, reminding me of this earlier image from Slacker Ridge (to the southwest of the current location, but in the fog). For information about this location, see my story Alignment. Wave, photo by Harold Davis. View this image larger. From my rocky perch jutting out into the ocean near Sculptured Beach, I played with photographing the waves as the sun set. This tripod-mounted 1/4 of a second exposure caught the abstract expression of a wave crashing, while retaining some literal relationship to the play of warm light on the wave against the cool blue of the surrounding ocean. Some related images: Wave (after Hokusai), Breaking Wave, Wave Tangent. 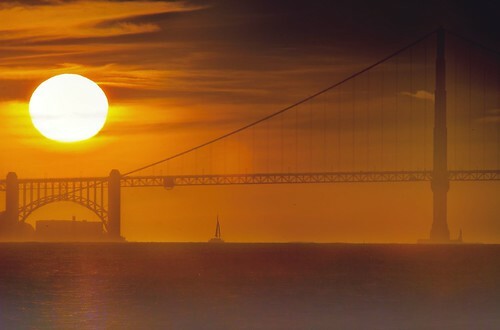 Golden Gate Alignment, photo by Harold Davis. View this image larger. On a balmy afternoon in late October I studied the topographic map of the USGS San Francisco North Quadrant. This map shows (among other areas) the hills above Fort Baker outside Sausalito, and the northern side of the Golden Gate Bridge. It seemed to me that there was a ridge that could be climbed going up from above Fort Baker. You can tell on a topo map if something is steep when the contour lines on either side of the white space representing the ridge top are spaced close together. If the contour lines aren’t drawn too closely across the top itself, there’s a good chance you can get up. My hope was to find a location across from the northern end of the Golden Gate Bridge so that I could shoot through both towers. I picked up my friend Mark and we parked on Wolf Back Ridge Road, high above Sausalito. Technically, this is a private, no-trespassing area carved into the Marin Headlands section of the Golden Gate National Recreation Area. We donned our hiking boots and backpacks, and scrambled down a steep hill to find the Coastal Trail. Heading south, we passed a high tension tower, and then trudged up the hill over the Waldo tunnel. From there, I could see a straight shot down the ridge I had observed on the topo quadrant map. The ridge line ended on a rock platform. Yes, the towers of the bridge aligned perfectly from north to south. 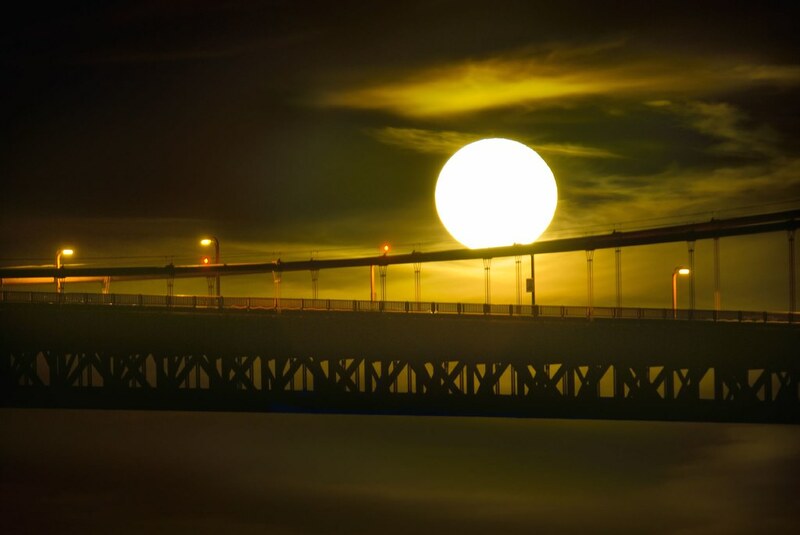 The setting sun lit the bridge from the west, and the waxing moon provided fill lighting from the other side. I positioned my camera on the tripod, braced it with my camera backpack to keep it from vibrating in the wind, and exposed for thirty seconds. The time exposure turned the car headlights and tail lights into lines of light beneath the bridge in alignment.